In Italy, on the south side of the Mont Blanc tunnel, Vallèe d’Aoste (French) — or Valle d’Aosta (Italian) — is the smallest and least populated (official) region in Italy. Historically part of the Kingdom of Savoie, both French and Italian are official languages and many of the place names are distinctively French sounding. It is also completely mountainous. In the local tourist office one can get a fabulous collection of cycling route cards (photo above), with info of rides of all levels of difficulty. Here is a map with many of the climbs listed on the route cards. I hope to add more green pins (roads I have cycled). Click the pins will give links to the blog post of the ride. Normal pins = road bike climbs. Star shaped symbols = mountain-bike climbs. EDIT: I have started adding Piemonte climbs to this map. This year (2014), I have been amazed at some of the truly fantastic, highs Alps climbs there. Colle del Nivolet, Colle dell’Agnello, Colle Fauniera, Colle di Sampeyre, and Colle della Lombarda, are 5 huge, high, and beautiful climbs. As good as anything anywhere. Nivolet might be my favourite climb ever ridden. By the way, your website is exceptional for me. I like bike and I love Alps, cycling them is one of my main interests, if not the first one: I just fell in love with it. Regarding the request in your post, I come from Aosta Valley. You look to have done many roads already. If I had to add one I would indicate the Champillon road, which starts from Doues (close to Valpelline, from where you went to Place-Moulin dam and Glacier). It’s very nice, goes up to around 2000 meters above the sea level, with a good view on Grand Combin mountain. At the top the paved road ends and I usually come back down. Otherwise an unpaved road, on a slight descent, leads you around the area above Glacier. Many thanks for the route idea! Much appreciated. I’ve just returned from 4 days of riding around Lake Annecy, followed by 7 days in Aosta. The weather was very kind & enabled us to get out riding every day – as with previous trips to The Alps, your website was invaluable in helping me pick great days in the saddle! Monday we drove from Annecy to Aosta, so by the time we’d checked into our hotel (Le Charaban on Grand St Bernard) & set up the bikes, we decided to do a short ride up to Pila. Tuesday we rode from Aosta out to Pre St Didier before climbing Colle del Piccolo San Bernardo – the weather was a bit changeable, so although we planned to do Colle del San Carlo, we wimped out when freezing rain started to fall & simply descended San Bernardo, before a sprint along the valley floor back to Aosta! Wednesday was an awayday – we drove to Susa & did both sides of Mont Cenis as well as your recommended side trip up to Petit Mont Cenis. A great day of cycling in perfect riding conditions, plus we had lunch in Lanslebourg where the owner is the daughter of the people who own the Relais on Mont Cenis! We tried this ride from the French side last year, but fog at the summit put paid to the day. Thursday we rode Grand St Bernard – a great climb, especially after the forest section ends! We found a side road to Valpelline from Etroubles. It’s a balcony type road (similar to the secret cliff road on Alpe d’Huez, although not as high!!). We made it as far as Bionaz before we had to turn around – we’ll be back to have another go at getting to Place du Moulin. Friday was the jewel in the crown – Colle del Nivolet from Locarna. It truly was the best day ever cycling & the views from the summit were totally out of this world!!! Saturday we cycled from Aosta & tackled the Pantaleone & Cervinia – all the Giro signs were still in place & there was loads of graffiti on the road. I deliberately chose an iconic Giro stage finish to follow Nivolet day, just so we didn’t try to compare the two days!!!! Finally we did a gentle ride out to Valsavarence yesterday & topped it off with an ascent of Val di Rhemes which shares the first couple of km of the climb. It starts off easy, but then has 3km of about 10km, before easing off again. The only disappointment was that there were quite a few gallerias, although we found the old road to avoid the longest one. Thanks so much for sharing all your rides & experiences – I always look forward to seeing where else I should be looking to explore!!! Congratulations on your Tour de Suisse ride, it looked incredibly tough! Wow, what a great trip. Ha, yes, Nivolet just blows the mind. Such an amazing place. But the rest of your list is great too. Glad you added Petit Mont Cenis to that day. I am hoping to visit the alternate 2nd way up the Italian side soon. But I love the Susa side near the top. 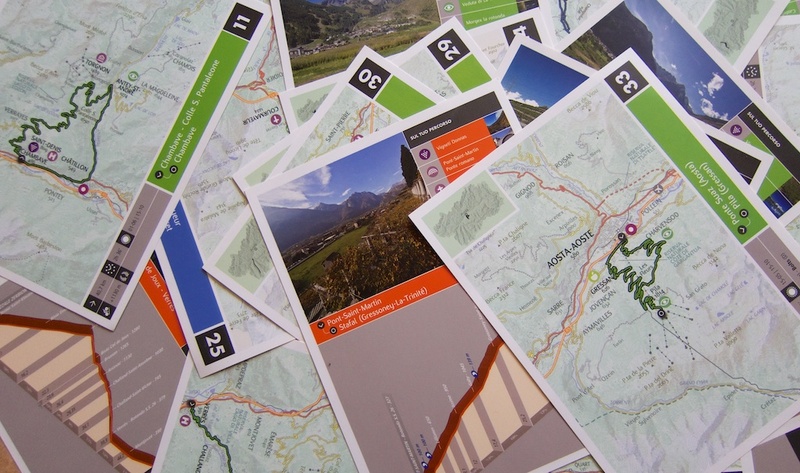 Of course, I will be staring at maps to have a look at your cliff road near Gd St Bernard. Anyway, very well done, and I am happy to hear I might have been of some small route-planning help. Maybe a future project are some of the huge Piemonte climbs south of Nivolet: Fauniera, Sampeyre, Agnel, etc. (more for me to explore there, but those are fantastic). there is a col in val d’Aosta you may want to visit: colle Youx (or Joux) 1930m. I climbed it from Runaz (on the main road SS26) to Avise, Cerellaz (where the road flattens, and some maps indicate a selle de la Charbonnière) and then before Fossaz take a sharp left toward Vens (about 1700m), and continue to the col. The last 300m or so are on dirt, but no problem on a road bike. Very quiet and beautiful road. One might continue beyond the col into the Comba di Vertossan, on a suitable bike though (I didn’t). Thomas, thanks for the tip. Greatly appreciated.